By Lisa Pluth in Web Design. Updated on August 3, 2018 . Back in 2010, site speed and page loading times have been added into Google’s algorithms. While not a headline grabber in comparison to the latest news about iPhones and social media, site speed issues are a thing of concern to web designers and it is also one of the best promotional tools around for growing a design business. Google has a tendency to change their algorithms (up to 600 times per year) so it can be a source of headache to keep up with these changes.Thus, it’s probably a good thing that Google offers the PageSpeed Service, an optimization service that will "automatically speed up the loading of your web pages". The idea behind the service is that you hand your web page and its contents over to Google and they "optimize" it with changes that will speed the site up then distribute it to their servers around the world. Technically, this puts them in charge of the end product, a product of your making. And eventually they are going to charge us for that service. If any of that that makes you feel uncomfortable, chances are, many other site owners feel the same way. But all is not lost, and in fact, there is a lot of money to be made and lost depending on how the page site service shakes out. Page speed and load times are impacted by many factors but image usage and design play a prominent role in speed, particularly in extending loading times for web pages. Moreover, speed is a metric every web user over the age of three understands. It’s also beautifully quantifiable. Here’s a collection of tools you can use to check your site speed, previously published on the site. Designers are spoilt for choice with the many optimization guides out there on how to make a page perform better for their site visitors. Here’s an Ultimate Guide to Web Optimization (Tips & Best Practices) to get you started. But getting clients to put their faith in you to help them speed up their sites for them, that’s a different story, and one that speed tools can help you tell. Speed tools are great for demonstrating a designer’s value and worth to current and potential customers. Let’s assume that you have several product web designs in your portfolio. By simply cross-referencing keywords, results from web site rankings and speed tools, you can identify clients with websites that need your help. What we are looking for are sites that rank (and are doing) well despite having horrendous site design or load speed. These are sites that have the money but need the know-how. 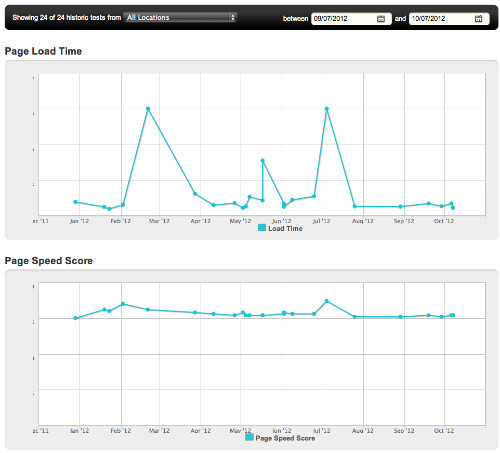 Once identified send the speed tests with a claim that you can easily speed up their entire site. It’s usually possible to gain several seconds, but under-promise and over-deliver. Also, give them links so that they can compare themselves with competing websites. Speeding up a site is often simple potatoes for a good designer. In any case, there are plenty of pointers on how to do so effectively everywhere on the Web. In addition, there plenty of image customization tools on the web that can make your first job for them a piece of cake. The point is to start a relationship with a potential client and give them a tangible benefit for your services that they and their customers can easily see and appreciate. Speed tests are exactly this type of tool. After the job is done there is concrete proof that your services are valuable. In the current economy you might not get requests for the entire site to be redesigned immediately. However when they are ready to do so, the likelihood is that they will get you to do it. Let’s say you are an experienced designer with a wide range of clients. You can use speed tools in the same way to demonstrate your value to your current clients and remind them that you are there when they need something more. Keeping up a dialog with your customers is vital to long-term success. You can do this by preparing speed testing and ranking graphs in their industries and comparing these with both the competition and their numbers from the year before. Include Webmaster tools analytics and prepare a beautiful printed report for your clients about their website. "Old-fashion" follow-ups in printed graphics is something that is often overlooked in the web design industry but one you can fall back on any time for branding exercise. Presentation reports are valuable because they provide clients with tangible proof that they can touch. This is something they can show off to their decision-makers or clients. The report can sit on their coffee tables for years displaying your logo and promoting your design services. Done correctly this can be one of the best branding tools any designer can use for their business. In conclusion, to date developments in Google’s attempt to dominate the web is watched closely by web designers. Our generation is one that is obsessed with speed, making it, in today’s marketplace, one of the best ways to sell a designer’s talents, generate new businesses and recruit new potential clients. Speed is a great tool when used properly and branded correctly. Put speed on your side and watch your design business flourish. Editor’s note: This post is written by Lisa Pluth for Hongkiat.com. Lisa is a PhD holder and a researcher for Brandme.com.au, Australia’s leading producer of promotional items and business gifts.